I knew Sir Hamish Hay rather well. He was Christchurch's longest serving mayor, for five terms from 1974 to 1989. He passed away on Monday, at the fair age of 80, as a result of Alzheimer's. In 1988, Sir Hamish and his Council, sponsored me to attend a Goodwill Mission to China. It was a great honour and one that opened my eyes and passion for the role of local politics. The irony is funny, in that many years later I find myself in a town where a former mayor got the residents to pay for him to go to China! His wife Judith, the Mayoress, was very supportive of the Duke of Edinburgh's award programme, that I co-ordinated in the garden city. I think we need a Mayoress to help Val out. The Hay's are a famous New Zealand family, and Hamish's father was a renown philanthropist. He founded a department store and supermarket chain, and was granted a knighthood. His identical twin brother, was also knighted for his work in medicine and health and his sister, Dame Margaret work for the United Nations with women's and peace movements. 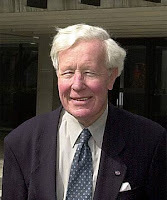 Hamish first became a Christchurch City Councillor in 1959, and in 1974 became mayor, holding office until 1989. He was responsible for spear-heading the building of the iconic Town Hall on the banks of the Avon River, in 1974, the year of the city's Commonwealth Games. He also helped oversee the building of New Zealand's national museum, Te Papa in Wellington. It's nice to reflect on those that influenced you, and Sir Hamish Hay was one of those who did.